Get more out of your Horizon Memory Craft 9400 QCP! 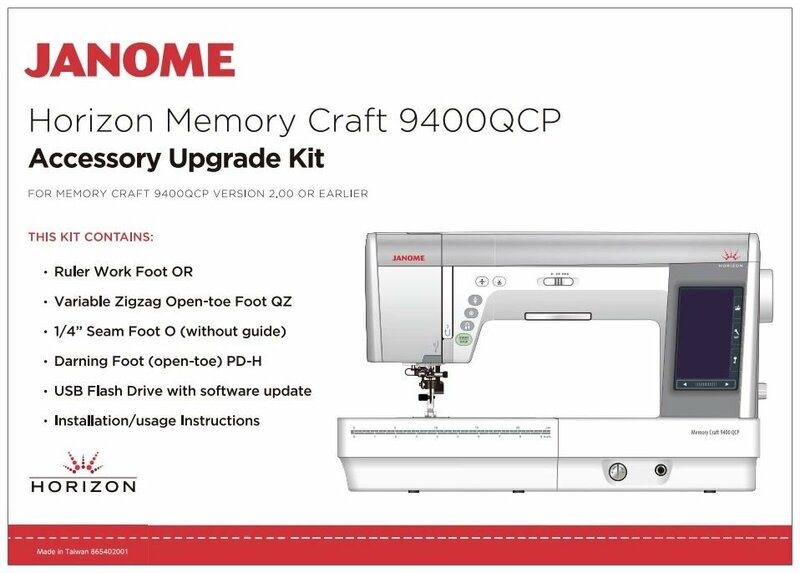 This upgrade kit unlocks new features in your machine and the new accessories make diffi cult sewing techniques easy! Included in the kit are four new presser feet and a USB containing the upgrade for your machine. This upgrade features the ability for your machine to work with the included Ruler Work foot: a feature previously only available on the Janome Top of the Line Model. This foot was developed for doing ruler work. Guide quilting templates along the edge of the foot to create straight, curved, or repetitious patterns depending on your ruler or quilting template. The v-shaped gap in the front enhances visibility. An open type variable zigzag foot which makes it easy to see your stitches as they form. Especially useful for detailed areas, layered stitch finishing or thread painting. Seasoned quilters prefer to use a 1/4” Seam foot without the assistance of guide to avoid catching on the seam allowance. There is even a 1/4” guide line on the left side of the needle drop for added convenience. For quilters who prefer to free motion with a darning foot, an opening in the front is a must! This open-toe darning foot makes the needle very easy to see.